Ozone free system, captures 99.97% down to .3 micron, particulates – dust, virus, dander, smoke, pollen, hair, etc. This configuration could also be used in applications for recirculating air, installed inside a closet or adjoining room, when the air filtration system needs to be unseen or out of sight. Kindly call us for help with your product selection. Call toll free from anywhere in North America, 1-800-626-0664. You may also use the contact form below. 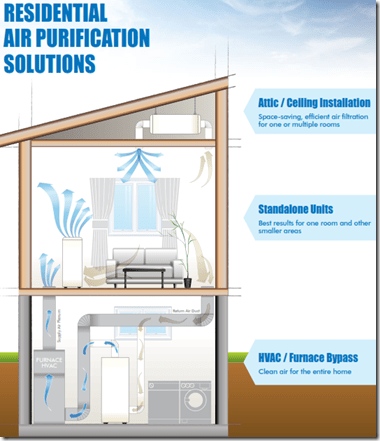 Combining our standalone recirculating systems, our ceiling mount – ceiling suspended – wall mount – horizontal systems, and our Central Air – Wholehouse – Furnace – HVAC – Bypass Air Filtration System, here’s an illustration of how they can be made to work in concert with each other. For more information, for help in choosing the right air filtration solution for your needs, please call us toll free at 1-800-626-0664.